Security is an important issue when working with Excel 2010 macros. If you open workbooks containing macros from outside sources, these macros can be harmful to your computer. By default, Excel protects you from running macros, but if you’re creating your own macros, you’ll probably want to change the protective security settings. 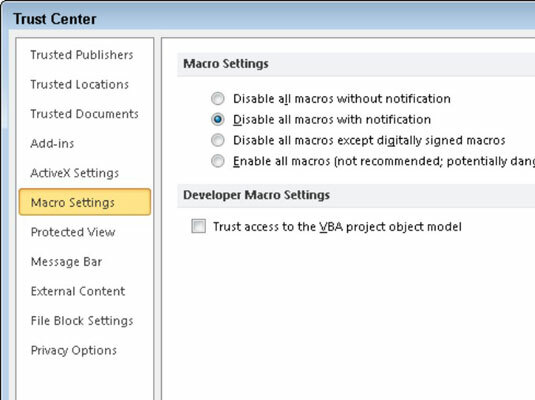 You’ll need to display the Developer tab on the Ribbon to access the macro security settings. Click the File tab and then click Options. Click the Customize Ribbon tab, and then select the Developer check box under Main Tabs on the right side of the dialog box. Click OK.
Click the Trust Center tab and then click the Trust Center Settings button. The Trust Center dialog box appears with the Macro Settings tab selected. Change the security level in the Trust Center dialog box. Disable all macros without notification: Allows you to run only macros that are stored in a trusted location. 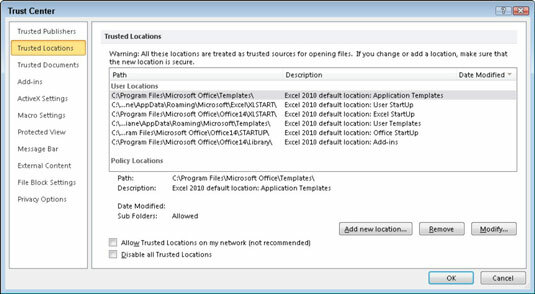 Click the Trusted Locations setting in the left pane to manage these trusted locations (see the figure below). Also, since the macros are automatically disabled, this option disables security alerts. Disable all macros with notification: Displays a security alert when a workbook with macros opens. You can then decide whether to enable the macros associated with the workbook. This is Excel’s default setting. Disable all macros except digitally signed macros: You can run only those macros that are digitally signed. Enable all macros: Allows macros to run without a notification. This can be helpful if you run a lot of macros, but be aware of the risk when using macros from unknown sources. A list of trusted file locations.